Today’s competitive blown film business calls for consistent, high-quality product and increased productivity. 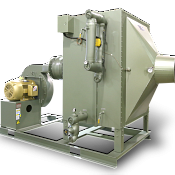 Sterling’s BFC Series blown film coolers boost productivity by eliminating production variables. Fully-engineered, chilled water coil assemblies deliver air ring cooling at constant temperature, pressure, and volume.